UNO’s School of Public Administration offers high quality and nationally accredited graduate degree programs. The School works closely with UNO's Graduate Studies Office to ensure the admissions process is as smooth and transparent as possible. Application for Graduate Admission must be filed with the UNO Office of Graduate Studies. Click to here to start your application. 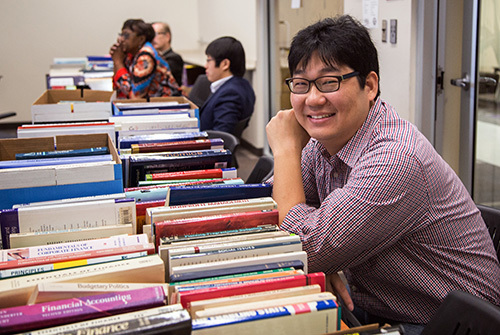 UNO’s School of Public Administration supports UNO's tradition of global engagement with international partners and a variety of programs to assist international students. Visit International Admissions How to Apply for more information. Students admitted to graduate programs at other University of Nebraska campuses must complete the intercampus registration form to register for UNO courses. Please review the materials listed below needed to complete the application. Only complete applications will be considered. Thus, apply early - before the application deadlines. Submit the online application for graduate admission. Submit a Resume including work history in Adobe PDF format. Please tell us about the factors in your background that will help us understand your interest in a profession in the public or nonprofit sectors. What are your professional goals? Ten years from now, what do you hope to be doing professionally? How can an MPA from UNO help you to achieve these goals? Submit Two letters of recommendation. Please provide the names and email addresses of two individuals who can address your qualifications for graduate study. The recommenders will be sent an online recommendation form to complete. Please inform each of them to expect this correspondence from the UNO Graduate Studies Office. Please review the materials listed below needed to complete the application. Only complete applications will be considered. Thus, apply early - before the application deadline. Please tell us about the factors in your background that will help us understand your interest in a profession in urban studies. How can a Master in Urban Studies from UNO help you to achieve these goals? 6. Submit Two letters of recommendation. Please provide the names and email addresses of two individuals who can address your qualifications for graduate study. The recommenders will be sent an online recommendation form to complete. Please inform each of them to expect this correspondence from the UNO Graduate Studies Office. Admission to the Ph.D. Program is the decision of the Dean of Graduate Studies based on the recommendations of the School of Public Administration Doctoral Program Committee. There are two application deadlines, one on January 15 for applicants seeking financial assistance and the second on March 15 for all other students seeking admission. There are 8 elements in the application portfolio (listed below), and all application materials must be received by the applicable deadline in order for the application to be reviewed by the Doctoral Program Committee. Applicants who enter the program with a master's degree field other than PA may need to complete up to four pre-requisites: Foundations in Public Service, Organization Theory and Behavior and Analysis and Decision Making. The letter of admission will specify which pre-requisites are necessary before enrolling in the core curriculum. All official transcripts from post-secondary educational institutions are sent to: Office of Graduate Studies and Research, Eppley Administration Building 203, University of Nebraska at Omaha, Omaha, NE 68182. International applicants who have completed any undergraduate or graduate coursework at international higher education institution(s) are required to submit a course-by-course transcript evaluation from World Education Services (WES), Educational Credential Evaluators (ECE), or Educational Perspectives. A five-page statement of intent describing what career the applicant wishes to pursue after completion of the Ph.D., desired areas of specialization, faculty with whom the applicant would like to work, and an explanation of academic and professional backgrounds and interests. * Required if applicant's native language (language of nurture) is not English and master’s degree is not from a university in a country where the official language is English. How can an a Graduate Certificate from UNO help you to achieve these goals?